whether the potential supplier is in a region that is permanently stable or whether you have to expect politically induced disruptions or even interruptions in production and delivery. whether your business partner or your own production facilities on site can be safely reached – and how. which parts of the country are suitable in the medium and long term for strategic expansion and adjustments of the production and supply chain network. What does resilience mean for your work and why is it an advantage for any location? Resilience is the ability to quickly recover from disruptions of the status quo, overcome crises and their negative side effects and consequences, and successfully adapt where a return to the status quo ante is impossible. Political risk exposure and susceptibility of local societies to violent crises plays a major role when it comes to the security of your supply chain. After all, war, terrorism or riots can put your employees’ wellbeing at risk, cause significant material damage, unsettle investors and encourage skilled workers to leave exactly those areas where you and your local suppliers would need them the most. Protests, strikes and blockades are at times accompanied by sensitive disruptions or even interruptions in production and the supply chain, but corruption, sabotage and vandalism are also unpleasant by-products and consequences of political conflicts. Wherever active government regulation is contested, weak or unenforceable, swift and smooth market entry is unlikely and the threat of compliance risks increases. Geographical, political, demographic and cultural factors ensure that political risks are on­ly equally distributed in small island and mini-states. 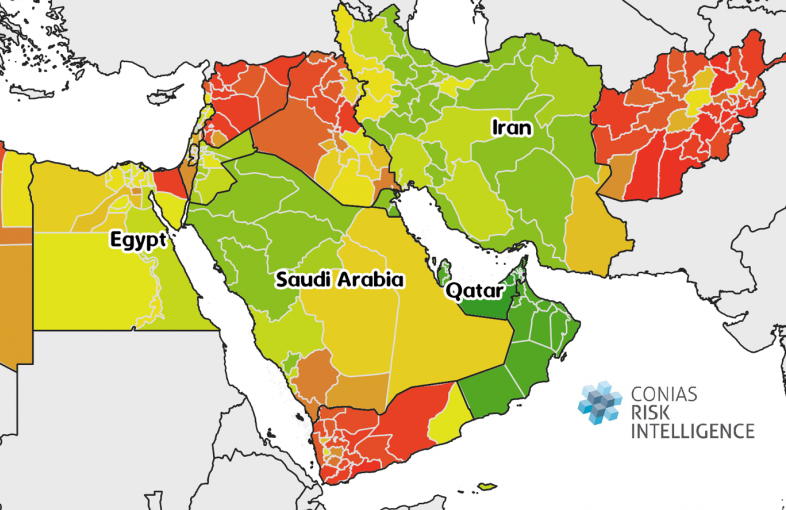 Some violent conflicts and the associated risks remain regionally limited for years. Others cause refugee flows and allow transnational actors to not only destabilize other parts of the country but also to destabilize neighboring states. In large countries such as Mexico, India or Turkey, it is thus not unlikely to find locations that offer optimal and long-term favorable conditions, and those that should be considered as "no-go area” for international com­panies. 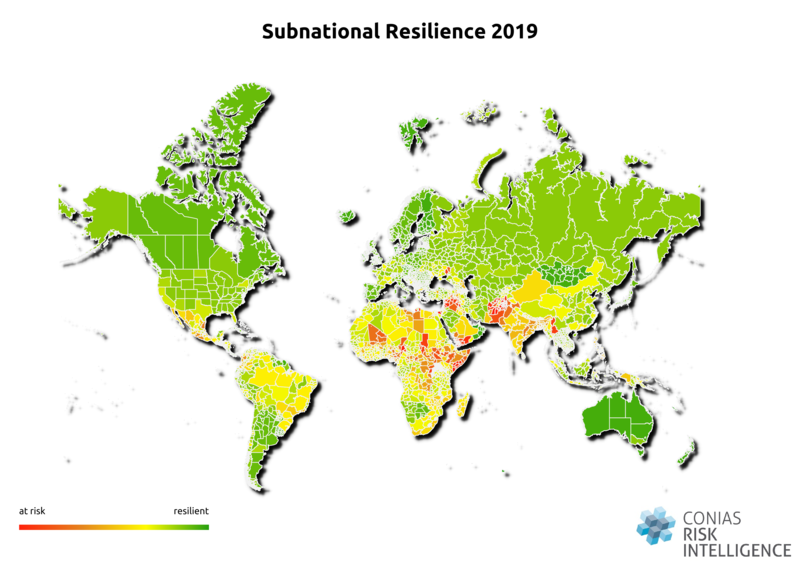 For this reason, CONIAS has developed analytical tools to assess subnational resilience, that do not only distinguish between 193 States, but differentiate be­tween more than 3,800 administrative units worldwide. If you are able to choose between two location sites within a country, it is absolutely necessary to always take resilience into account. Contact us today for a free initial assessment of your potential supplier! Why is it important to stay up to date on resilience? 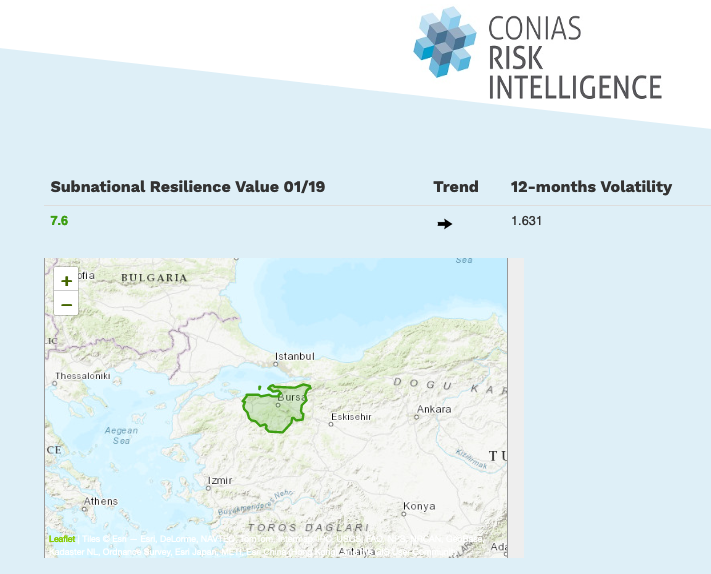 Between December 2018 and February 2019 alone, our systems detected significant changes in resilience levels in more than 350 provinces. More than half of them have apparently partially recovered from violence experienced in the past year. Because yes, positive trends still exist in politics! Looking at developments on the national level, future investments and, above all, enhanced security for production facilities and supply routes, especially The Gambia, which experienced the first power transition since 1994 in early 2017, and Tunisia, which seems to have recovered from protest waves in 2018, have improved significantly. But also negative developments, threatening to spill over into other provinces and neighboring states, are easier to recognize and locate with the SURE dataset. For instance, the security situation in West Africa's Mali remains not only poor, but also turns out to be contagious as its neighbor Burkina Faso has been destabilizing itself for several months. In Venezuela, the ongoing crisis around President Maduro and respective political violence has not (yet) reached all parts of the country. However, since the beginning of 2019, violence has also spread to the agricultural centers Lara and Yaracuy. Their resilience level has deteriorated significantly in comparison to the end of 2018. 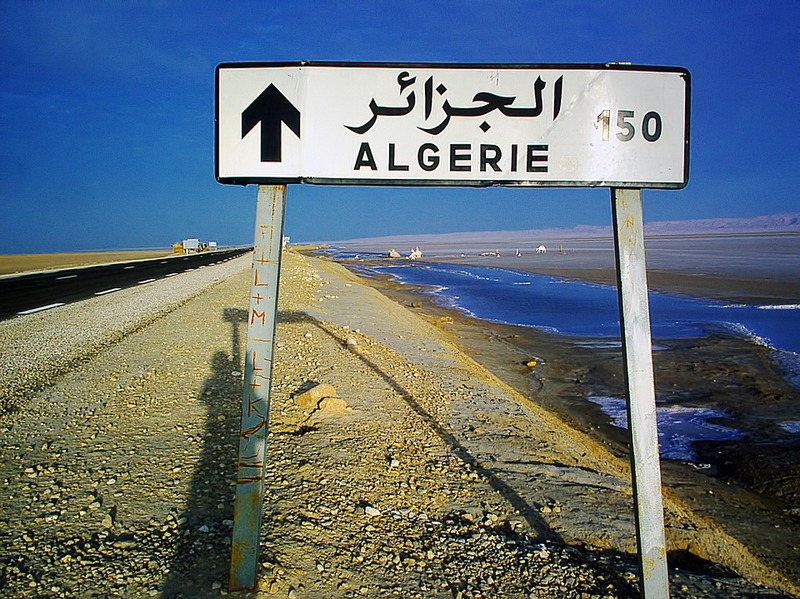 Using the example of the North African state of Algeria, the added value of the CONIAS approach becomes particularly clear - especially in highly complex political situations. Some 200 German companies employ and train more than 2,000 locals in the country, which is also among the world’s top 20 oil exporters. The SURE record captures 1,800 political conflicts at the same time, including the protests of recent months, which caused the "eternal" President Bouteflika to resign last week and a gained attention worldwide. However, the systematic analysis of these protests also shows that only in the provinces of Sidi Bel Abbe, Boumerdes and the capital Algiers turned sporadically violent - a clear sign that the government has a great interest in the stability of the country and good relations with the West. At the same time, the resilience level of other provinces, such as Khenchela or Jijel, improved significantly. This had been caused by the Algerian security forces’ successful efforts to reduce the presence and activity of Islamist terrorists, including Al Qaeda. How can you identify political risks in your supply chain with the SURE dataset ? We show you how it works! You send us anonymized address data, we deliver in the formats csv, json, shapefile, geopackage, geojson and spatiallite the respective rating - quick, confidential and uncomplicated. Depending on the extent of your needs, we offer package solutions from single to global inspection. Together with us, you pre-determine locations, we deliver monthly, quarterly or yearly updated evaluations as well as updates on local developments. We make orientation and integration into existing monitoring systems easy and locate our values ? ?on an interval scale (0-10). Corresponding color classes show you at a glance which areas are classified as resilient, stable, fragile or even unsafe according to our own scientific approach. You want to know if the current location assessment is based on a positive or negative development trend? Our site evaluations are based on 60 months of careful analysis of local developments, we are happy to provide you with trends or historical data. You want to know with which fluctuations you have to reckon in the respective location environment? We provide you with volatility values (12 months) and keep you up to date when negative limits are exceeded. Being able to offer our customers a product tailored to their needs is our top priority, which is why we always recommend a personal consultation.